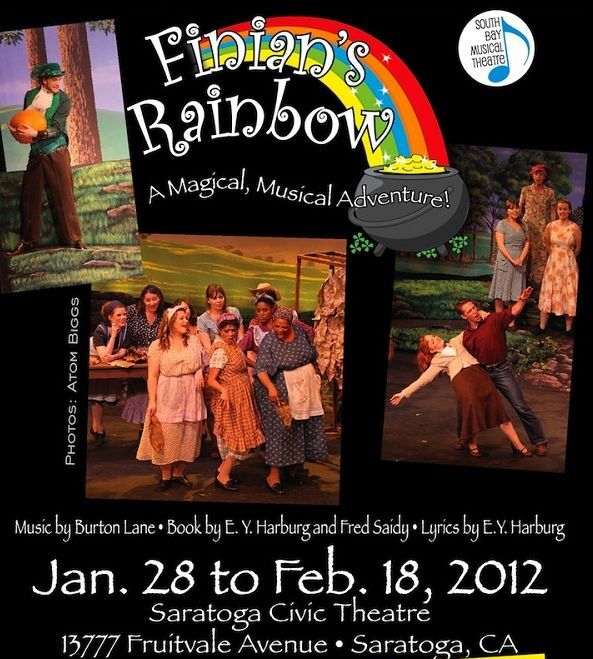 South Bay Musical Theatre’s current production, “Finian’s Rainbow”, requires willing suspension of disbelief. The musical with book by E. Y. Harburg and Fred Saidy, lyrics by Harburg, and music by Burton Lane originally hit the stage in 1947, so this is vintage Broadway attempting to tackle social and political issues of the time with satire, romance, and fancy. The story is disjoint and doesn’t work, though if audiences don’t take it too seriously the show makes for an entertaining and uplifting evening. The plot follows Finian McLonergan (Jay Steele) and his daughter Sharon (Kerie Darner-Moss), along with a sprightly leprechaun named Og (Martin Gutfeldt) tracking them as they arrive from Glocca Morra, Ireland in the Rainbow Valley in the mythical state of Missitucky, USA. Finian “borrowed” Og’s crock of gold to plant it near Fort Knox so that he might make it grow for himself, but that doesn’t go over very well since without their gold, the leprechauns of Glocca Morra will quickly lose their magical powers and be relegated to being mere mortals, an unthinkable fate. In Missitucky, the trio lands in the middle of a group of honest sharecroppers just trying to get by. Woody Mahoney (Damian Marhefka) owns the land the sharecroppers work along with his sister Susan (Cierra Cass). Woody quickly becomes smitten with Sharon, and the McLonergans rapidly win the hearts of the sharecroppers. A major conflict arises when Senator Billboard Rawkins (Greg Goebel and James Creer), a racist who needs to be taught a lesson, is intent on kicking the Mahoneys and their sharecroppers off their land for failure to pay back taxes. He uses his henchman Buzz (Ross Arden Harkness) and the local Sheriff (Scott Stanley) to assist him citing the “law of the south” which doesn’t allow blacks and whites to work side by side. In a pique of anger, Sharon “wishes” Rawkins would turn black, and with a flash of light, he does, giving him unique insight into both sides of the racial equation. All the while, Og is slowly becoming mortal as his magical powers slip away the longer the leprechauns’ gold is missing. It wouldn’t do to take this any farther leaving the plot resolution to the interested theatergoer, though it’s fairly predictable how the story eventually ends despite some spurious twists along the way. Doug Brook (Director), Diane Milo (Vocal Director), Esther Selk (Choreographer), and Brian Haslanger (Musical Director) have assembled an able cast that gives us several standout performances. Steele is intriguing as Finian. He has an ease with the role, and he’s fun to watch as he weaves his ludicrous tales of how to grow his wealth. His accent is smooth, his manner believable, and he’s got his Irish jig down. Marhefka and Darner-Moss have excellent stage chemistry, but then they are both veteran performers who’ve done several shows together over the years. They have an ease with one another that only comes from a long and endearing on-stage association. Their voices blend beautifully in such favorites as “Look to the Rainbow” and “Old Devil Moon”. Gutfeldt’s Og is fun. While not the strongest vocalist in the cast (though to be fair, his songs are more novelty than musical), he has boundless energy and a charisma that makes the gallery root for him. His character has to slowly transform from leprechaun to mortal, and he has to appear to grow. A tall fellow, he starts the show dressed in green and crouching to hide his height still moving surprisingly freely. As he slowly transforms over the course of the story, he stands taller, and his costume changes from green to brown, the “browning” starting at his feet and moving up until the last thing to go is his hat – kudos to P.J. Simmons’ costume design. Goebel and Creer make an interesting pair playing the same character, one white, the other black after he is “accidentally” transformed by Sharon’s wish. Goebel is appropriately outrageous prior to the transformation, and Creer steals the show when he first appears and discovers that he’s been turned black, comparing his hand to those around him to determine what has happened. Creer has another standout moment in Act 2 when he stumbles upon three members of a gospel quartet (Ronnie Grigsby, Jayson Lamb, and Dave Leon) wandering in the woods desperately needing a baritone. The resulting number “The Begat” is great comic entertainment. Cass’ Susan the Silent has a tough job through most of the show much like the mute in “The Fantasticks” offering commentary through her dances. Her big solo number, “Dance of the Golden Crock”, done to the tender strains of Dan Zulevic’s harmonica, is a turning point in the story and is captivating to watch. The ensemble is strong, both in executing the intricate choreography, much of which is reminiscent of a spirited hoedown on top of a vigorous Irish jig, and vocally, their rich harmonies elegantly blending. In addition to the Gospeleers, the other standouts in the ensemble are the members of the “Necessity” trio (Paula V. Warren, Maggie Velasquez, and Melissa Palmieri). While most of the staging works and has some clever bits, in some of the smaller vocal numbers, the actors are cheating out so much that their interactions aren’t natural. Haslanger’s orchestra is strong and well balanced overall, and there is never any competition between cast and orchestra. This is quite a coup for the instrumentalists and sound designer John DiLoreto given there is no pit, so the musicians sit in the house between row one and the stage. The only notable deficiency in balance is that the keyboard isn’t loud enough except when on a celesta patch. Sadly (speaking as a musician), one of the greatest compliments a “pit” orchestra can receive is that they aren’t noticed, and much of the time, this is the case. The times when they are conspicuous are appropriate such as during the overture (lengthy by current standards, but not even close to the longest overture known to Broadway) and some of the exuberant dance numbers, the exceptions being momentary string intonation issues and a couple of muddy brass and reed licks. The harp is lovely and adds a nice color to the overall effect. The set is fairly simple provided by Stephan Wathen drops and a few pieces such as a house and a swing which are moved by cast members at key points in the story. Two large, climbable trees and associated shrubbery flank the stage just downstage of the proscenium. A few small technical issues were noted during the performance, one slightly detracted from the transformation when the full blackout didn’t occur to cover Goebel’s exit and Creer’s entrance. Another wasn’t immediately obvious during a set move when Harkness covered it so well that it didn’t read like the error it was. The net of this one is to try to ignore the story, and just sit back and enjoy the performances on stage. It’s worth the trip. When: Continues through 18 February Thursdays (16 February only) – Sundays, evenings at 8PM, and matinees at 2:30PM. Info: See www.southbaymt.com or call 408-266-4SDG (4734) (available 24 hours a day).